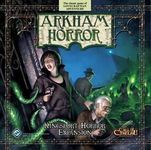 This Variant is recommended for players of 4-Investigator Arkham Horror games, using every available expansion. I have play-tested this Variant on over 30 games, with a win-rate of 66%. I highly encourage you to try it and let me know how it works for you. Mythos 0 - Turn 4: As you put into play the Mythos card, only place gates in Arkham. Ignore Double-Doom cards and Rumors. If you reveal an expansion board Gate location, resolve everything else...Monster Movement, Clue token, and Headline/Environment. Starting on Turn 5, play each Mythos card, as normal, revealing Gates anywhere on any board. Rationale: In this way, you should, based on the percentages for each Gate opening, have 2-3 Gates open in the first four Turns, instead of 4-5. Rumors: Reduce the # of tokens, as if you were playing with two Investigators for Rumors such as Nightmare Pool, but for The Key and the Gate, consider 4 Investigators in play. Rationale: Rumors should be difficult to pass, but not impossible, given the great distances Investigators must travel when all boards are in play. Maximum # of Gates: 10. Rationale: There are 20 Unstable Locations across the four boards. Ten open Gates represents 50% of all of the locations with the potential to spawn a Gate. 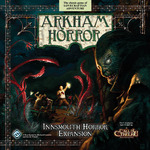 Maximum # of Monsters in Arkham and the Outskirts: 5. 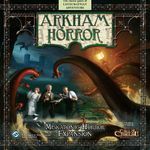 Rationale: As with Rumors, above, playing as if you had two Investigators would warrant a Maximum # of Monsters in Arkham at 2 + 3= 5 and for simplicity, I've used the same value for the Maximum # of Monsters in the Outskirts. Allies: Investigators may, when directed to "draw and Ally" take it from the initial pile of 11 Allies or when they use the Ma's Boarding House Special Ability. Otherwise, I absolutely permit the Investigators to draw from the original 11 Allies or from the pile of Allies which I keep at Ma's Boarding House when an Ally is introduced during an encounter. Allies discarded when the Terror Level rises come from the original stack of 11 Allies. Guardians and Heralds: I always use the King in Yellow, and now especially with the Miskatonic Horror KiY cards, it never dilutes! Also, I use the Guardian Hypnos for Clue tokens and Lurker at the Threshold. One small thing I need to correct in my variant regarding the Lurker is that only those Investigators who take a Dark Pact are subject to the penalty associated with cloing a Gate. I couldn't agree more on the "richer story" notion, as I'm a 30+ year RPGer. Yes, I do use all of the Gates, including the ones from Lurker at the Threshold. currently, I use an opaque container, but soon I'll have them stacked in the tower of our Cthulhu's Caldera piece [yes, that was a shameless plug for our Crafthulhu card holders and component trays]. Please check-out the Expansion-specific Variants below. 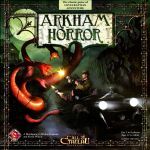 Again, Arkham Horror isn't about winning, it's a about the story, the theme. As I've said many times before, "it's about the journey, not the destination." If I can maintain a win rate consistent with the average based on 10,000 games on Tibs' spreadsheet, while enjoying the game that much more, great! Curse of the Dark Pharaoh: No changes (I've currently incorporated both the original and the new version, so play includes both "Barred from Neighborhood" cards & Patrol Markers). The King in Yellow: Use the cards, if available, from the Miskatonic Horror expansion. Additionally, the Environment cards have no Herald-type effect for the initial Mythos card or those from the first four Turns. Kingsport Horror: Apply a Rift Marker/Token to the Rift Track only when a new Gate opens on any board, including Gate Bursts. Optional: As the Rifts occur over the town of Kingsport, place the newly opened Rift at the location designated by the last placed Rift Marker/Token on the Rift Track instead of at the Gate location on the Mythos card. Rationale: Performing "Rift Duty" can prove boring for most Investigators. At least having a potential combat in Kingsport should make things interesting. Rifts opening in Kingsport, is the very premise of the expansion... "as these tears in the fabric are happening over this coastal city." 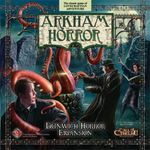 Innsmouth Horror: Place a Deep Ones Token on the Deep Ones Rising (DOR) Track only when a monster enters a vortex or directed by an encounter. Additionally, once the DOR Track is full, add a Doom Token to the Doom Track instead of automatically awakening the Great Old One. This happens during every Mythos Phase while the DOR Track remains filled. Rationale: Similar to the Rifts in Kingsport, the DOR Track should not be the focus of the Investigator's skills and abilities, but there are times when they may need to travel there and deal with the situation. The DOR Track should not serve as a 2nd Doom Track. Lurker at the Threshold: You may not use the Power tokens as Clue tokens when the card is exhausted. Thus, if an Investigator takes a Blood Pact, exhausts the card and sacrifices 3 Stamina to receive the 3 Power tokens, place them on the exhausted Blood Pact card. During the next Turn's Upkeep Phase, refresh the Blood Pact card, allowing the Investigator to use the Power tokens. Rationale: Given the currently accepted rule, it's far too easy to exploit the Lurker.